The mouthpiece is the most important component of the clarinet set-up. A good clarinet with a bad mouthpiece will still sound bad. A good mouthpiece with a bad clarinet can sound surprisingly good! In my opinion, mouthpiece makers of the past used a flawed theory for making student mouthpieces, which I will discuss in the next paragraph. 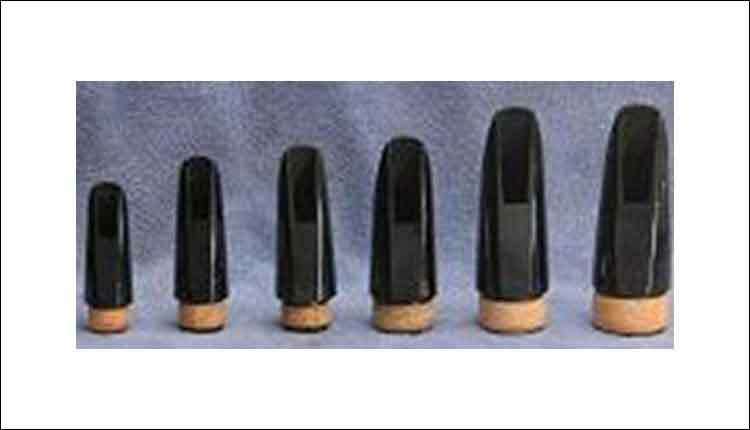 Most mouthpieces marketed to students in the past and today have a very wide tip opening (the distance from the tip of the mouthpiece to the tip of the reed). A wide tip opening requires a soft reed to play. The theory is that a student can place a soft reed on this open facing and achieve a sound right away. This theory is true, however, while a soft reed allows one to make a sound easily, the sound is very difficult to control. It is my contention that playing these mouthpieces produces a bad sound and reinforces bad embouchure habits. To compound the problem, I’ve heard numerous band directors and teachers try to solve this problem by merely putting a harder reed on the mouthpiece. In fact, the mouthpiece’s facing and tip opening determines the strength of reed required. So, a reed that is too hard for a particular mouthpiece will only frustrate a student and be next to impossible to play. While there is something to be said for a student achieving a goal quickly to maintain interest, it is my belief that we should instead give the student a mouthpiece and reed combination that is close to what a typical professional plays. The mouthpiece tip opening should be rather close with a hard reed. A bit more time will be required for a student to feel comfortable with the resistance of this set-up, but it will force the student to develop a correct embouchure and the student will achieve a good, typical clarinet sound more quickly. How do you find a mouthpiece such as this? It can be more difficult than you might think. Special tools are available to measure the facing and tip opening, but it is unrealistic to expect band directors to have these or to take the time to measure mouthpieces for each student. It is also unrealistic for music stores to have the tools or knowledge about mouthpieces to be able to authoritatively inform the band director. So, the band director must rely on mouthpiece manufacturers to accurately label facing measurements or styles to determine which mouthpiece will work best for their clarinet section. Unfortunately, the machining process which large companies utilize to finish mouthpieces is inconsistent at best, so what is labeled as medium close may in fact be something completely different. In testing mouthpieces of large companies, it has been my experience that there is wide variation of measurements within one model, making consistency questionable. This can be overcome by refacing each mouthpiece or by customizing reed strength recommendations for each mouthpiece. It is my recommendation that small companies that hand-finish mouthpieces be used to equip your clarinet section, as they are more likely to test every mouthpiece manufactured and will be more likely to be available to answer individual questions of band directors and students. While we make the Gennusa “Excellente” Intermediate mouthpiece in this way, we are not implying that this mouthpiece will be the answer for every player and every band director. I highly recommend trying all the different brands available, and if you are not a clarinetist, ask a clarinetist friend to help you determine which sounds best. It is also necessary to test mouthpieces with a quality reed of the appropriate strength. A close faced mouthpiece with a soft reed will sound terrible, but with the right reed, this could be the best combination available. An intense testing session with various mouthpieces will provide your students with the best possible equipment on which to play and will reward you in the end with an homogenous, typically clarinet sounding clarinet section! Please see my article entitled Understanding And Selecting A Clarinet Mouthpiece to help you select the best mouthpiece available. Ben Redwine is the Eb clarinetist for the US Naval Academy Band. He is a recording artist for the MapleShade Record label and can be heard around the Baltimore/ Washington, D.C. area performing as a free-lance clarinetist and saxophonist. Ben is the owner of RedwineJazz, LLC, and makes the Gennusa “Excellente” clarinet mouthpiece and Redwine brand harmony clarinet and saxophone mouthpieces. He is a Selmer artist and plays Selmer Recital clarinets, CanyesXilema reeds, and Gennusa “Excellente” clarinet mouthpieces. He is more than happy to answer clarinet related questions at anytime. You can find him at www.redwinejazz.com.